Amsterdam, April 17, 2019 – Sometimes the wind brings sand from the Sahara to the Netherlands. The sky can turn orange from it and, with light rain, everything can be covered with a layer of reddish dust. Researchers have turned their attention to microplastics in the air. These also appear to be settling out of the air and able to travel long distances. As a result, they end up everywhere, even in remote natural areas. In the mountains of the French Pyrenees, far from civilization, it was investigated how many microplastics fall out of the air onto the ground every day. Samples were taken over a five-month period, and measured both dry and wet (carried by raindrops) deposition. 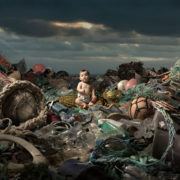 On average 249 plastic pieces were found per square meter per day, 73 pieces of film and 44 fibers. Calculations showed that the wind could transport these microplastics easily over a distance of 95 kilometers, and presumably over much longer distances. 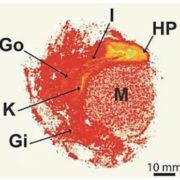 The article appeared in Nature Geoscience. While quite a lot of research is being done into microplastics that find their way elsewhere via water, our knowledge about microplastics in the air is still very limited. In 2016, microfibre fallout was measured for the first time. In Paris and in a suburb of Paris, the microfibers settling out of the air every day were recorded. Between two and 355 microfibers per square meter per day were counted. Last year, Chinese researchers found that the daily fallout in the Chinese city of Dongguan was between 175 and 313 microplastics per square meter. Most of the microplastics there were synthetic microfibers. Read also – How damaging is breathing in microplastics? Blue smoke curls up from my terrace. After the last puff, a flesh-coloured filter is thrown carefully into the garden, disappearing between the roses and the rhododendrons. I’m shocked. I think it’s messy, cigarette filters in my garden, on the street and on the beach. “Don’t worry, it will disappear” is the standard reply to my mild disgust. And that always silences me: if it’s going to disappear, am I not being too critical to make a point of it? My shock deepens after reading the dirty truth about cigarette filters on the CNN website. The reality? 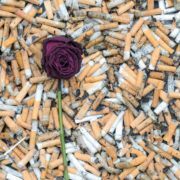 There is cellulose acetate in cigarette filters, a kind of plastic that only disappears under extreme circumstances. That might be OK in a wastewater treatment plant: but in my garden or on the beach the filters are almost indestructible. There they will gradually disintegrate into continually smaller particles which, in the end, will be invisible to the naked eye. It looks as if the filter has disappeared: but the plastic is still there. It’s in the soil and in the water. And who knows: maybe it’s in my roses and in the frog-spawn as well…. There are a mind-blowing number of cigarette butts littering the world. It’s the number one plastic item that we throw away. Every year, 6 trillion cigarettes are sold: 90% have a plastic filter. That’s more than a million tons of plastic rubbish. Clean-ups on the Dutch tourist beaches have shown the same result: the cigarette filter is the most commonly-found plastic item. And yes: as I stroll along the loose sand on the beach, I often feel a filter between my toes. Cigarette filters don’t contain only plastic, but also a cocktail of toxic substances: arsenic (rat poison! ), lead, nicotine and pesticides. As the filter disintegrates, the chemicals seep into the soil or the water. A university in the US did a test with fishes: they let them swim around in water where cigarette filters had been floating for 24 hours (one filter per litre of water). After a coupe of days, half of the fish were dead. Filters were invented to improve the health of smokers. They don’t, according to another survey. The chance of getting lung cancer actually increases as a result of the filter. I wish that I could say that I was too critical with my disgust for cigarette filters. I would happily accept all those filters shot between my roses and rhododendrons – and those between my toes on the beach. But the truth is unfortunately much dirtier than I thought. Luckily, the solution is easy: it’s there just waiting to be picked up. Ban the filter cigarette. Everybody – and everything – wins. 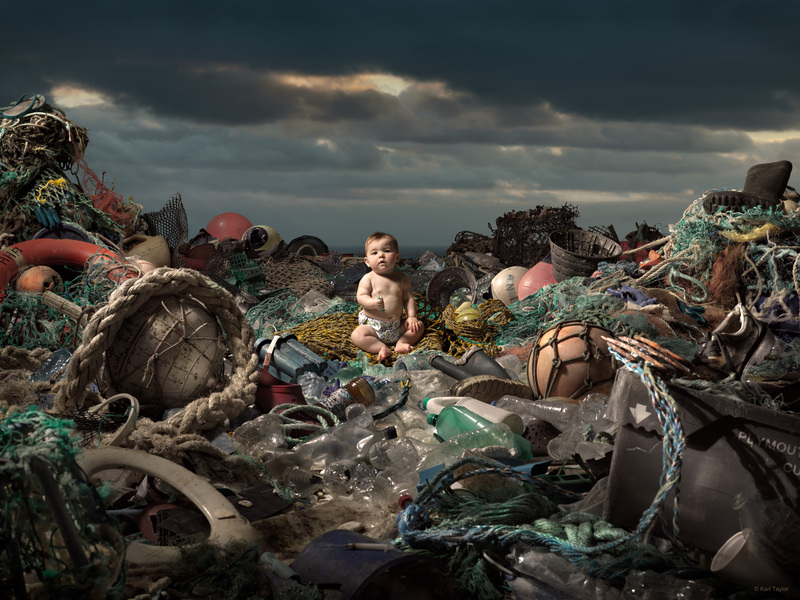 Thanks to Dutch national hero Boyan Slat, we all know the truth these days: our oceans are full of plastic. Even in the Mariana Trench, a trough in the western Pacific Ocean, miniscule pieces of plastic still swirl around at a depth of almost seven miles. A long way away, was my initial reaction: but now it seems that our own North Sea is also a well-filled plastic soup and even the gentle River Maas carries raw plastic rubbish. Now I’m only waiting for the news that there’s plastic in the ground water under my feet. That will be the end of it, it can’t come any closer. I thought. I hoped. Until somebody thrust a list under my nose. A list full of things that I use every day. Some of them made from plastic, others which I would never have dreamt contained plastic: tea bags, table salt, honey, beer….. The Plastic Soup Foundation and the VU University Amsterdam will this year be researching what the effect is on our bodies. A question which had never occurred to me…. The test list includes the plastic kettle, and in my imagination I clearly remember the trusty, bubbling machine that brightened my kitchen for many years. Hundreds of pots of tea I made with that machine. My mind conjures up a memory of a convivial cloud of steam. The test will tell me whether or not I was swallowing tiny pieces of microplastic, hardening agent and flame retardant as I slurped my tea. Oops. The test list contains more surprises. It’s probable that I am massaging poisonous plasticisers and nanoplastic particles in to my skin every day as I apply my super-soft day cream. Sunscreen, shower cream, shampoo, make-up: same story. I begin to feel a bit uncomfortable, and quickly pass over the question what the plasticizers that are apparently included in tampons may be doing to me…..
My house turns out to be full of plastics that the researchers want to investigate with regard to their effect on my health. Those handy bottles and containers in the kitchen. The sport clothes that make me feel so fit. The warm fleece blanket that I wrap myself in on the couch. My yoga mat for those quiet moments. The rug in front of the fire, the curtains, even the paint on the walls. Is a bit of all of those things now part of the inner me? It’s hard to buy an apple any more that has not been made more attractive by the application of a shiny coating of plastic. To be safe, it will be tested for all kinds of undesirable substances: plasticisers and hardening agents, flame retardants, fluorides, micro- and nanoplastics. 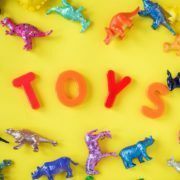 It’s known that these substances are in some way related to a lot of the typical ailments of our time, such as ADHD, dementia and Parkinson’s disease. I’m in two minds: do I really want to know? In the end, it’s the inclusion of milk powder for babies on the list that really gets my attention. Even that contains tiny particles of plastic. So we are feeding on plastic, every day, starting from our earliest days. In that way, the soup is very close to home: it seems I may have my own plastic broth in my body. I need to know more about that. Professor Anas Ghadouani and his team at the University of Western Australia in Perth have tested metal and plastic water bottles. The immediate cause was that more and more people refill purchased bottles with tap water for environmental reasons; it means that you do not need to buy a bottle again and again. But how harmful is this refilling plastic bottles for your health? According to Ghadouani glass and metal bottles are safest, especially bottles made from stainless steel. 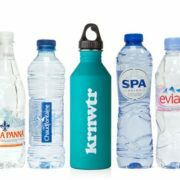 They are followed by the plastic bottles that are specially made to be reused, such as for instance a Dopper. The professor says that in general it is wise not to do this longer than one year. Refilling PET bottles is nothing short of the worst option, as there will always be plastic particles in the water. Especially when you place such a bottle in the sun, many microplastics are released. Read the university’s press release. 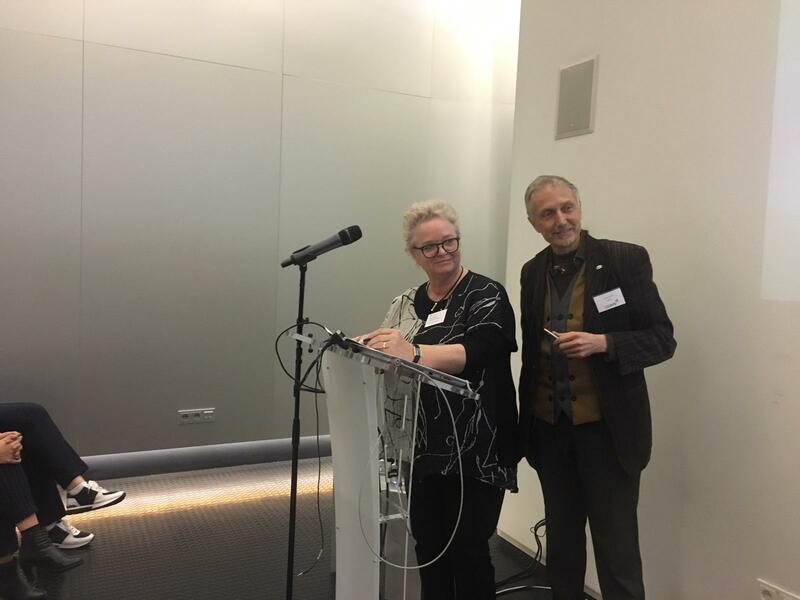 Amsterdam, 11 December 2018 – The threat of microplastics to our health and that of animals is probably far larger than we realized up to now. For the first time ever, research has shown that nanoparticles are quickly absorbed by marine organisms, in this case the king scallop (Pecten maximus). Previous lab studies were performed with far larger concentrations, but this time realistic conditions were taken into account, namely the concentration of nanoplastics that can be expected in the marine environment. The international research appeared in Environmental Science & Technology. The researchers developed a new measuring method and even fabricated detectable nanoplastics (carbon radiolabeled nanopolystyrene). The results are truly alarming. 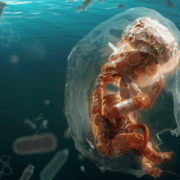 Within six hours billions of microplastics (of 250 nanometers, approx. 0.00025 mm) penetrate the tissue of the marine organisms. Within a few hours even smaller particles (20 nanometers, approx. 0.00002 mm) permeate organs such as the liver, gills and muscles. These smaller particles also enter the bloodstream. While the particles spread, toxic substances also spread through the body. It took weeks after the animals had been transferred to clean water for all the plastics to leave the body. The 20 nanometer-particles could no longer be detected after two weeks. King scallops (St James shell, great scallop) are a well-loved food. The Netherlands Nutrition Centre recommend shellfish and crustaceans as a healthy choice. This recommendation does not yet take this new scientific insight into account. Amsterdam, 13 November 2018– Is plastic pollution causing microplastics to penetrate the food chains of freshwater ecosystems? A recent research answers with a yes. Half of the examined insects from rivers in South Wales turned out to carry microplastics that must have originated from the water or the soil they live in. Immature mayflies and caddisflies from three rivers were examined for microplastics. The sampling areas were found upstream and downstream of five water purification plants. On all locations microplastics were found in the insects. Contrary to the expectation of the researchers that insects downstream would contain larger amounts of plastics than those upstream, no significant differences were detected between the locations. 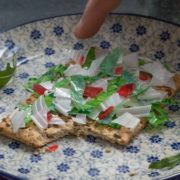 Because the examined insects have different diets, the researchers could also investigate whether choice of food plays a role in the exposure to microplastics. This turned out not to be the case. However, the mayflies that primarily live in the water, did turn out to contain considerably less microplastics. This in contrast with the mayflies that search for similar food on the river bed. So, a preference for a certain habitat, water or soil, might provide an explanation for the different amounts of microplastics found. The researchers express their concern about the spread of microplastics in food chains through insects. 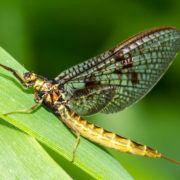 Especially fish, but also other animals – such as amphibians and predaceous insects – feed on mayflies and caddisflies. This mechanism was also brought to light in another recent research.